This single was released as a radio promo 5" CD-single in Norway only and features the album version of the song. The cover has a blurry green-white background colour (no photo) and a text box in which the name of the group, the title, the playing time, the music and production credits etc. are listed. 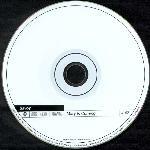 The CD in itself is plain white with titles and group credits.